The Woods Family Music and Arts Grant, managed by the Community Foundation of NCW, has awarded $56,628 in grants to schools and nonprofits across North Central Washington. Established in 2011, the Woods Family Music and Arts Grant provides up to $5,000 to support programs that foster and improve arts and music awareness, education, performance, events, and professional development. The annual grant is open to 501(c)3 nonprofit organizations and public agencies in Chelan, Douglas, and Okanogan Counties. “The Woods family are incredibly passionate about access to art and music for everyone in the region” said Erika Orsulak, the director of education programs at the Community Foundation. The Community Foundation of NCW has awarded $216,950 in Regional Impact Grants to 28 nonprofits across North Central Washington. The Regional Impact Grant (RIG) is an annual grant open to any 501c3 charitable nonprofit or public agency in Chelan, Douglas, or Okanogan counties to support specific projects or general operations for programs that make a positive impact in their communities. Each applicant is visited by a team of Community Foundation staff and Trustees to learn more about their organization and grant request to determine award recipients. Over 60 applications were submitted, making this year’s grant very competitive. Each of the grant recipients received a portion of their grant request, as the amount of requests received far exceeded the amount the foundation was able to award. That’s where Give NCW comes in. Give NCW is an online crowdfunding campaign that showcases each of the nonprofit’s projects and programs and asks the community to donate to help them reach their initial fundraising goal. To view the list of participants and donate to their projects, visit www.givencw.org from Thanksgiving Day to December 31st. Minimum donation is $10, and the Community Foundation is absorbing all credit cards fees so 100% of the donation supports the nonprofit. Donations can support multiple projects in one transaction, or the Give to All option allows your gift to be divided among each organization. The following organizations also received Regional Impact Grants, but will not participate in Give NCW. The next Regional Impact Grant will open in July 2018. All awarded recipients must wait out one year before re-applying. The Community Foundation of NCW would like to thank and recognize the Wenatchee World for its partnership in Give NCW and helping to showcase the charitable work of nonprofits across the North Central Washington region throughout the campaign. Frauke Rynd was a lucky “Funday Monday” winner and supported some of her favorite organizations with an extra $500 from the foundation. The Community Foundation of NCW is pleased to announce its Give Methow campaign has raised $220,533 for 32 Methow Valley nonprofits. 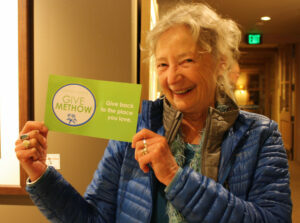 Give Methow is a crowdfunding campaign that runs in October and was created by the foundation to build awareness about local nonprofits in the Methow Valley and provide a way for people to easily support their work. Any 501c3 public charity in the Methow Valley was eligible to participate to raise funds for up to $10,000 to support a specific program or general operations. Thirty-two organizations participated, all providing a unique quality of life for the Methow Valley – from the arts to environment, health and housing to education, recreation, and community services. As a fundraising incentive, an anonymous donor who loves the Methow Valley seeded a $30,000 stretch pool to be distributed across the organizations based on how much they raised. An additional $2,000 was added to the pool by people who wanted to support all organizations, which allowed some Give Methow participants to exceed their goals. Individuals who gave on Mondays were entered to win $500 or $1,000 to use on Give Methow any way they chose through the foundation’s “Funday Monday” contest. On the final Funday Monday, 375 donations were made totaling over $32,000. Give Methow will run again in October 2018. The Community Foundation of NCW is pleased to announce new Board Trustees who have joined our organization: Matt Canlis, Lester Cooper, Leslie Freytag, and Dr. David Kolde. Each of them brings leadership and expertise from business, faith, and health arenas of the community. Lester Cooper was born in England and immigrated to North America in 1965. In 1992 he purchased a home in Lake Chelan and is now a full time resident. Lester retired from an extensive career with General Electric and throughout his career traveled the world, gaining a unique understanding of many different cultures and diversity. Lester enjoys everything Lake Chelan has to offer, is active in the community and serves on many boards, and believes strongly in dedication to community. Rev. Matt Canlis was ordained in the Church of Scotland, and currently serves at Trinity Church in Wenatchee. Matt has a Master’s of Literature in Theology from the University of St. Andrew’s, a Master’s of Divinity from Regent College, and his B.A. in History from the University of Washington. Leslie Freytag is a highly accomplished senior executive, entrepreneur, and turnaround expert with more than 40 years of success in retail. She is a brand management and targeted sales strategist. Most recently, Leslie was the President and CEO of butter LONDON, where she took an underachieving startup to a successful, global operation. Leslie graduated with a Bachelor of Science in Textiles and Clothing from Colorado State University. She is the founder and Principle of her own consulting firm, the Freytag Group, where she continues to provide advisory services to retail companies. Leslie and her husband Tony live in Wenatchee. Dr. David Kolde is a graduate of UCLA and Hahnemann University Medical School and has been practicing family medicine in the Wenatchee Valley for 15 years. He is married to Kaye and has two children, a son who is a senior in high school and a daughter who is a junior. He enjoys tennis, the outdoors in the Pacific Northwest, and traveling. The foundation wishes to acknowledge outgoing Trustees for their time and service to the North Central Washington region: Bart Clennon, Lisa Day, and outgoing Board Chair Katie Kavanaugh Pauly. We are grateful for their long-term investment of service with the foundation! Be Clearly will host Live2Lead WenatcheeValley on November 3. This event is a half day, leader development simulcast experience designed to equip attendees with new perspectives, practical tools, and key takeaways they can put into practice immediately. The event is scheduled from 7:30-noon and will be held at the Numerica Performing Arts Center in Wenatchee. Attendees will learn from world-class leadership experts, including Dr. John C. Maxwell, Dave Ramsey, Cheryl A. Bachelder, and Warrick Dunn who will be presenting to a live audience in Atlanta, GA and is rebroadcast here locally. Attendees should expect to be prepared to embrace a growth mindset, implement a new action plan, and start leading when they get back to the office with renewed passion and commitment. “We created the event to not only create personal and professional growth for participants, but to create value for our community in three ways: first to challenge participants to think more broadly about the role they play and how they add value to the community, second to direct proceeds from ticket sales to our Benefit Partner, The Community Foundation of NCW – creating funding for a leadership academy for non-profit leaders throughout our region, and third that each of the first 150 ticket purchases, will automatically fund a mentorship ticket enabling an equal number local high school and college students to attend. Imagine – 150 next generation leaders learning right alongside up to 350 of our region’s best leaders, thinkers and doers.” Brine added. Dr. John C. Maxwell, the #1 New York Times bestselling author, coach, and speaker who has sold more than 26 million books, was identified as the #1 leader in business by the American Management Association® and the world’s most influential leadership expert by Business Insider and Inc. magazines in 2014. In that year, John also received the Mother Teresa Prize for Global Peace and Leadership from the Luminary Leadership Network. His organizations — The John Maxwell Company, The John Maxwell Team, and EQUIP — have trained more than 6 million leaders in every nation. Dave Ramsey is America’s trusted voice on money and business, Dave Ramsey is a personal money-management expert and extremely popular national radio personality. His seven best-selling books—Financial Peace, More Than Enough, The Total Money Makeover, EntreLeadership, The Complete Guide to Money, Smart Money Smart Kids and The Legacy Journey—have sold more than 10 million copies combined. Cheryl A. Bachelder is a passionate restaurant industry executive who most recently served as the CEO Popeyes® Louisiana Kitchen, Inc. Cheryl is known for her crisp strategic thinking, franchisee-focused approach, development of outstanding leaders and teams and superior financial performance. She brings more than 35 years of experience in brand building, operations and public-company management at companies like Yum Brands, Domino’s Pizza, RJR Nabisco, The Gillette Company and The Procter & Gamble Company. Warrick Dunn is a former NFL running back and a three-time Pro Bowl selection, known for his success both on and off the field. Dunn’s football career began at Florida State University and in 1997, was drafted by the Tampa Bay Buccaneers. He played for the Bucs for five years before signing with the Atlanta Falcons in 2002. Six seasons later, in 2008, he returned to the Tampa Bay Buccaneers for his final season. The Wenatchee World and Jennifer Korfiatis Marketing are presenting sponsors of the event as well as passionate advocates for whole community thinking and action. Up to $200 Available to Support Your Make a Difference Day Project! $200 grants available to help your Make a Difference Day project! 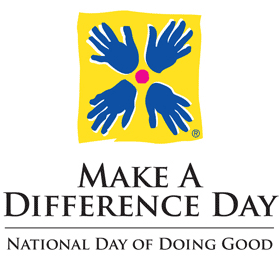 Did your organization coordinate a Make a Difference Day project last year? If so, you might be eligible for a grant of up to $200 to support your 2017 project! The funds can be used in a variety of ways to help implement or enhance the quality of volunteer efforts for your 2017 Make a Difference Day project. Recipients must be 501c3 charitable organizations, public agencies (schools, cities, government, etc. ), or projects can be fiscally sponsored by a qualifying agency. Applying for the grant is easy! Just let us know the title of your 2016 project and a description of your 2017 project. That’s it! For questions on qualifying agencies, email jennifer@cfncw.org. This grant is made possible through USA Weekend Magazine prizes from the Gannet Foundation, now managed by the Community Foundation of NCW. The Community Foundation of NCW is now accepting applications for the Eric C. Jensen Memorial Grant to improve literacy through technology and increase the ease and accessibility of information in libraries. This grant is open to public libraries and public school libraries within the boundaries of Cashmere, Entiat, Wenatchee, and East Wenatchee School Districts. Awards range from $500 – $1000. Previous programs funded by the grant include an Apple TV and two iPad teaching stations at Lewis and Clark Elementary Library and audiobooks and iPod shuffles for Pioneer Middle School Library. Established in 2003, this grant honors of the work of Eric C. Jensen, which focused on expanding the use of information technology through innovative programs in the community. Application deadline is November 1st. Special Guest, Peter Drury is the Vice President for Mission Advancement of the Make a Wish Foundation (Alaska & Washington) and Adjunct Professor in Seattle University’s Master of Nonprofit Leadership Program. The Community Foundation of NCW in partnership with the Icicle Fund is now taking reservations for the annual Board Celebration Dinners that honors and recognizes nonprofit board volunteer service. For current board members of nonprofits in Chelan, Douglas, and Okanogan Counties, the Board Celebration Dinners provide a complimentary dinner at either Sun Mountain Lodge in Winthrop or Sleeping Lady Resort in Leavenworth along with a short program to recognize the important role of board volunteers and inspire continued service to community. The evening includes a presentation by special guest, Peter Drury, Vice President for Mission Advancement of the Make-A-Wish (Alaska & Washington). He also serves as Adjunct Professor in Seattle University’s Master of Nonprofit Leadership Program. Peter has extensive experience working with charities, nonprofits, and community foundations. He will inspire the evening with the impact of storytelling to engage our communities in supporting charitable causes. Seating is limited and reservations are accepted on a first come, first served basis. Reserve seats online at www.cfncw.org/boardcelebrationdinners. A credit card will be required to reserve a seat, but will not be charged except for no shows or late cancellations. Reservation deadline is September 29th. The Community Foundation of NCW has seen significant growth over the last decade, and in response has hired new staff to better serve its generous donors, regional nonprofits, and college-bound students. Erika Orsulak has joined the foundation as the Director of Education Programs. This position manages over 100 unique scholarship funds, connecting students across North Central Washington to scholarships that can ease the financial burden of a college education. Erika will also oversee the foundation’s education-focused grant programs, including the Stronger Schools Grant that supports public schools and school districts. Erika has worked in the nonprofit and philanthropic sectors for over 17 years. Most recently, she worked for the National Scholarship Providers Association and Washington Women in Need. Claire Oatey has joined the foundation as the Director of Community Grants. This position manages the foundation’s competitive grant programs, including the Regional Impact Grant and the Helping Hands Grant. Claire will also oversee the Nonprofit Practices Institute, a capacity-building program in partnership with the Icicle Fund that serves the region’s nonprofits. Claire has several years of experience working in various areas of the nonprofit sector, including Rebuilding Together Seattle, an animal welfare organization, and The Center for Early Childhood Programs in Colorado. The Community Foundation has also created a new position, Director of Philanthropy, which will be assumed by Denise Sorom, the foundation’s former Director of Community Philanthropy. Denise will be stewarding current and interested foundation donors, and supporting the continued growth of community philanthropy in our region.